What links Hollywood, a chewing gum tycoon and contraceptive darts? It's the story of an unusual herd of bison. Calvin Duncan crouches low to the ground and eyes his target. The female bison knows he's there, just a few dozen metres away, but she keeps on chewing the grass. Duncan quietly raises his rifle to eye level and centres her in the crosshairs. The only evidence that he hit her is a brief disturbance within the herd. The bison rearrange themselves and go back to munching. Duncan drops a flag to mark his position and moves off in search of his next target. Duncan is not here to hunt them; he's a scientist shooting them with contraceptive darts. Above: A Catalina bison with a visible ear tag. This population of bison is utterly unique. They are not in Yellowstone, nor the vast plains of Wyoming and Montana, where you would normally expect to see such beasts. They have lived for nearly a century on Catalina Island, 35km off the California coast. The unusual story of how they got there – and what happened since – involves a Hollywood studio, a chewing gum tycoon, and an experimental way to control their numbers. The Catalina bison first came to the island as movie stars, around 100 years ago. At the start of the Hollywood's Golden Age, Catalina Island served as a de facto back lot. The film industry hadn't fully embraced aviation yet, and it was cheaper to film movies in locations that were relatively close to the studios in and around Los Angeles. In December 1924, 14 bison were shipped to the 192 sq km island by Lasky Film Company for their silver screen debut. Catalina Island historians aren't quite certain for which film the bison were intended. By some accounts, it was for The Vanishing American, a 1925 silent film western based on a book by novelist Zane Grey. A more plausible guess is that they were to feature in a different silent western called The Thundering Herd, also filmed in 1925, and also based on a Grey novel. The reason that nobody knows for sure is that the bison never actually made it onto the screen. When the productions concluded, the producers, directors, actors, and everybody else returned to the mainland. But perhaps owing to the expense of barge transportation, the bison were left behind. They would remain on the island doing what bison do best: eating and mating. With a starting stock of just 14 individuals in 1924, the bison would have faced a shortage of genetic variation. So over the next 10 years, chewing-gum businessman William Wrigley, who owned a controlling interest in the Santa Catalina Island Company, shipped 24 more individuals onto the island. By the 1960s, the bison had all but taken over Catalina. They outcompeted the other grazers, like the mule deer. By various estimates, there were more than 400 and perhaps as many as 600 wandering the tiny island's interior. The Wrigley family began culling. Their intention was to maintain a herd of between 250 and 300 animals. Between 1969 and 1977, 267 individual bison were shipped to the mainland. But in the midst of shipping the bison away, 22 bison were introduced into the herd, again to maintain genetic variability. Another 12 were introduced in 1996. This is what happens when humans try to maintain a healthy herd of large grazers in an enclosed space. The herd grows too large, so humans intervene to thin it. The herd may remain at a manageable size for a few years – females only give birth to one calf at a time, and spend three of four years raising it – but then humans must intervene again to bring new genes into the herd and prevent inbreeding. The Wrigleys' solutions to their bison problems, while imperfect, suggested that they accepted a moral obligation to care for them. In 1972, the Catalina Island Conservancy, a conservation and education non-profit, took control of 88% of the island, and the bison too. For several decades, it shipped bison off to the mainland. Some returned to the Great Plains in the American west, while others were sold at auction. But in recent years, the conservancy has taken a more integrated, ethical approach. Julie King searches the herd for the bison in need of contraception. Ninety years ago, filmmakers were trying to turn the bison into movie stars. Now the cameras being trained on the bison are to gather information to keep them healthy. Crouching a few dozen metres behind Duncan as he aims a contraceptive dart on a bison, Julie King captures his efforts on video camera. Together, the two biologists work to manage the island's bison herd, along with the rest of the island's wildlife, and the video footage helps them to keep track of which bison they've successfully shot. Duncan's ammunition includes a small vial containing just one-10,000th of a gram of a clear liquid called PZP, a vaccine derived from pig cells that acts as a contraceptive. It works by tricking the females' immune system into binding antibodies onto her own eggs, preventing any male sperm from doing so. In a scientific paper written about their research, Duncan and King refer to it as "romance without responsibilities." "We do not prepare the vaccine until we are preparing to deliver it," Duncan explains. After combining the two parts, it can be kept in a refrigerator overnight before it becomes useless. "It is not an expensive vaccine, it only costs $22-25 to buy," he says, "but if you see what it takes to make this, it's pretty disrespectful to waste it." Each and every dose is prepared by a just single person at the Science and Conservation Center in Billings, Montana, where Duncan received training in wildlife contraception. PZP is commonly used for contraception in American zoos, but only rarely for free-ranging wildlife. Duncan usually prepares the vaccine in the field just before he is ready to administer it and only makes three to five doses at a time. The darts are filled with a contraceptive vaccine and an adjuvant, which makes the vaccine more effective. Prior to the conservancy's contraception experiment, more than two-thirds of the female bison delivered calves each year. In the first year of contraception, just 10.4% of females delivered calves. In the second year, it was down to 3%. And in 2013, just a single calf, dubbed Uno, was born. Though the programme initially instituted by the Wrigley family was unsystematic (for example, thanks to the complexities of social hierarchies, introduced males may never actually successfully breed) the herd initially maintained a reasonably healthy level of genetic diversity. Now that the conservancy has instituted an apparently effective programme of contraception, there is the possibility the bison may need another dose of new genes. "We haven't had any new genetics coming into the population in quite some time," King says, "but they have such slow reproductive rates that it's not as big of an issue as [for species that reproduce in] large litters, multiple times per year". Calvin Duncan takes aim, ready to inject a bison with a contraception-filled dart. So why does the conservancy work to actively maintain the herd at all, rather than letting them die out? After all, the bison were never meant to be there in the first place. Other invasive species, like feral goats and pigs, were got rid of. Donna Harris, marketing director for the Catalina Chamber of Commerce, says they're still a big draw for tourists. "It's marketed as a buffalo safari, or bison safari, without having to go to Yellowstone," she says. Catalina's "Jeep Eco Tour" is operated by the Catalina Island Conservancy. Indeed, a stroll through the main retail street alongside Avalon's harbour reveals countless bison refrigerator magnets, bison postcards, bison shotglasses, and all manner of wares for sale to visiting tourists and cruise ship travellers. One store features a life-size bison statue on the roof. 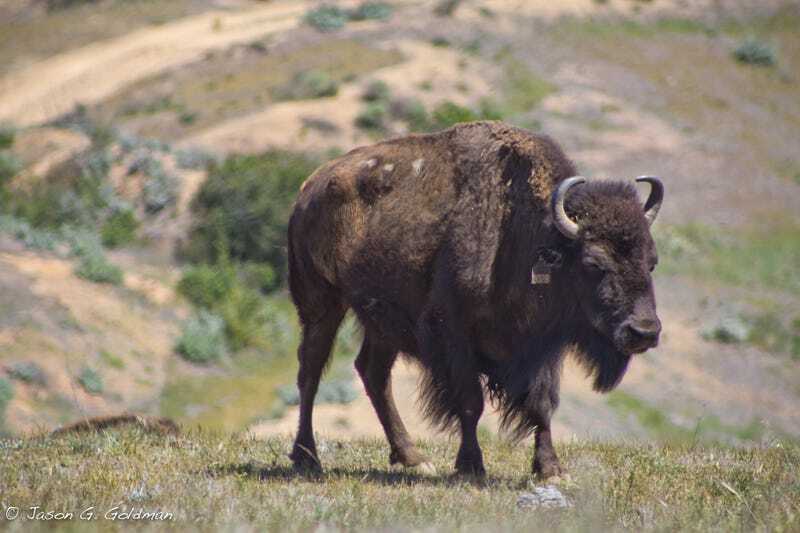 The research being conducted with Catalina's bison herd is of tremendous scientific value. Duncan and King's findings could eventually help other wildlife managers maintain healthy populations of other animals, particularly in enclosed spaces like game reserves. But it does beg the question: are the bison so intensively managed because they're charismatic, and profitable to boot? Wildlife tourism is an increasingly important tool in the conservationist's toolbox, but what happens to species that aren't quite so charming? This post originally appeared at BBC Future. It is reposted with permission.